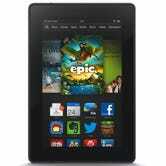 In addition to the new Kindle Fire HDX, Amazon also has a new, low-cost model of the original Kindle Fire HD. But unlike the discount on the original Kindle Fire last year, the redesigned HD is a pretty good bargain at $140. The new model has a redesign to look like the new HDX—they're very angular now. But to refresh your memory, the Fire HD has a 1280x800 screen, a 1.2GHz TI OMAP processor (not great, but good enough), 1GB or RAM, and was, for all intents and purposes, a perfectly decent tablet to watch movies on or read a comic or magazine. When the dust settled last year, it didn't quite measure up to the other $200 tablets, but at $140, with a new design to boot, it's not half bad.